I have this page to talk about strategy and safety. There is a lot of concern about using a trolling motor out there, I always hear "looks cool but I would hate to be stranded out there when my battery dies" The thing is, I have never been stranded in the Ultraskiff before. Trolling motors are much more reliable then combustible engines, here are my thoughts on what could possibly go wrong and some honest interpretation. 1. Your battery does not just "die". I admit, I am a saltwater guy. The skiff is obviously more suited to freshwater fishing but I am a salt addict. So that’s why most of videos are in saltwater. I developed a system and strategy for using the skiff in saltwater here on the Gulf of Mexico that produces results and while keeping safety a primary concern, this strategy can also be used on larger freshwater lakes. I'm addressing later in this article about the importance of staying within a zone or range of your launch point when using a single lead battery, which is what I do. Let's use some common sense here. A plastic boat with a trolling motor should not go into big concentrated fast moving saltwater inlets with a lot of boat traffic when the tide is ripping. Nor should you try to go down fast moving rapid like rivers. I plan my trips carefully and have a very good knowledge of the tides, weather and currents. Always wear or carry a PDF, have a collapsible paddle, whistle and always bring your cell phone. The Ultraskiff is ok for tidal saltwater/brackish rivers. I travel good distances in these conditions using the skiff but I like to fish through the tide change. I can skiff miles up river with an incoming tide, wait for the change and then head back down river to my launch point after the tide changes. This way I can travel farther, faster and safer throughout my trip. When I fish my #1 priority is safety and getting back to my launch point at the end of the day, no fish is worth putting your personal safety in jeopardy. I recommend first using the skiff in a small lake or protected area so you can get acclimated to the way the skiff handles, steers and gain a better understanding of your available battery life and available power throughout your trip before you go into a harsher environment. Once you launch a small boat like this with a single lead battery you are then committed to using it within a certain range of your launch point. I call this range my "zone". My zones tend to have a 1 to 2 mile radius depending on weather conditions and battery size, with the goal of always being within a mile of my launch point. I may travel up to 10 total miles during the course of my day on one DC 29 or 31 battery within the zone, but I know I am always within a safe distance from my launch point. This way if something should happen to my trolling motor I know that I don’t have that far to paddle to get back. Trolling motors have less problems than combustible engines but they are in no way 100% reliable. You can bring an extra battery, but you can’t bring an extra motor. I have not had a motor stop running yet, but I have broken a propeller pin on an oyster bed, I admit it was a freshwater motor and it rusted away but luckily they sell prop kits for most motors and I always carry a spare pin and screwdriver in my tackle box. I have never had a problem before using my saltwater motors in salt water. Anything can happen on the water so I like to be prepared with a collapsible paddle in case my motor does go bust one day. There is something to be said about using a nice name brand motor like Minn Kota. Always bring an capable anchor and enough rope with you in case you need to wait for help. I also always have a phone that I can check updated weather forecasts and make an emergency call if necessary. I always bring a capable anchor with enough anchor line in case I had to wait to be towed back and a PFD with a horn or whistle in case something more serious happened. Here is my basic strategy for using the Ultraskiff with a single lead battery. I generally can fish an entire day on one battery, I just draw out a zone and start fishing I dont spend my day running around at full speed, Im trolling 1/3 to 2/3 power most of the time and anchoring when I need to if the wind is blowing. When I find an area I want to fish I draw out a ZONE. The first ingredient to creating a zone is a Launch Point. 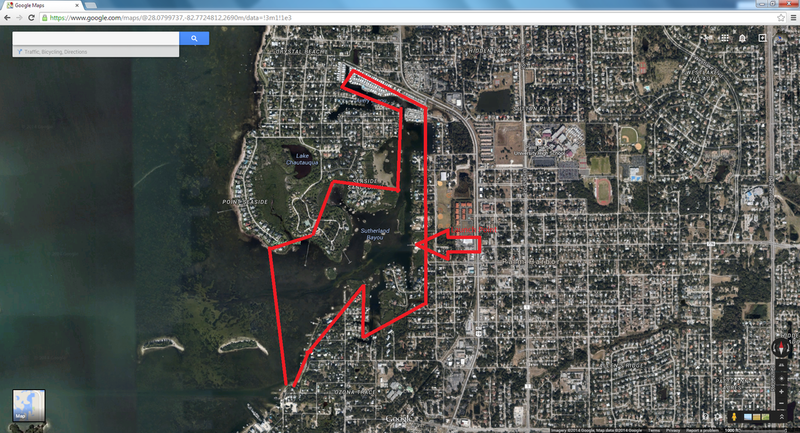 After I have chosen and scouted out a launch point I then use Google Earth to check out the area. Using the skiff is about launching it in an area within the general vicinity of where you intend to fish. 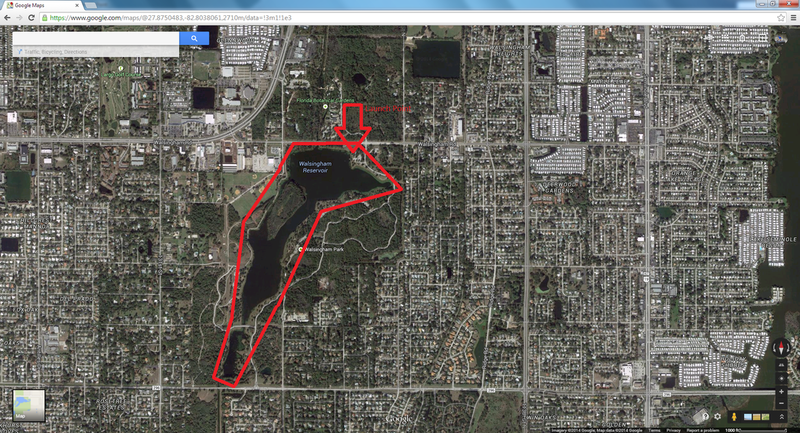 I study each zone in google earth with great detail. 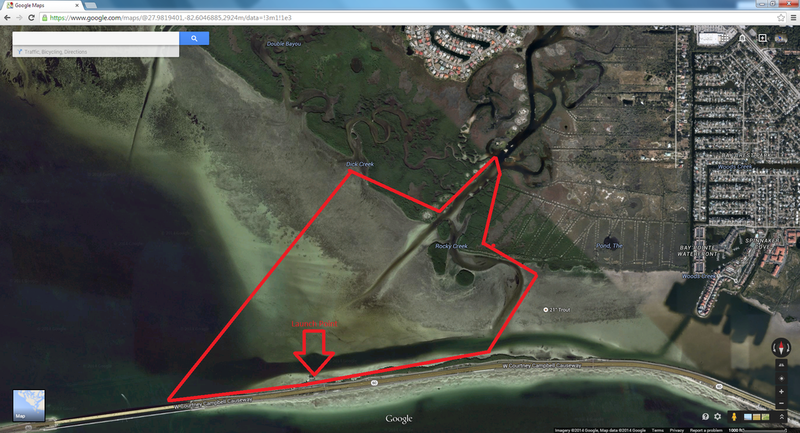 I know where every Pot-Hole, Oyster Bar, flush channel, drop-off, feeder creek and sand bar is. I then keep notes each time I fish a zone so I know where and when I caught fish. 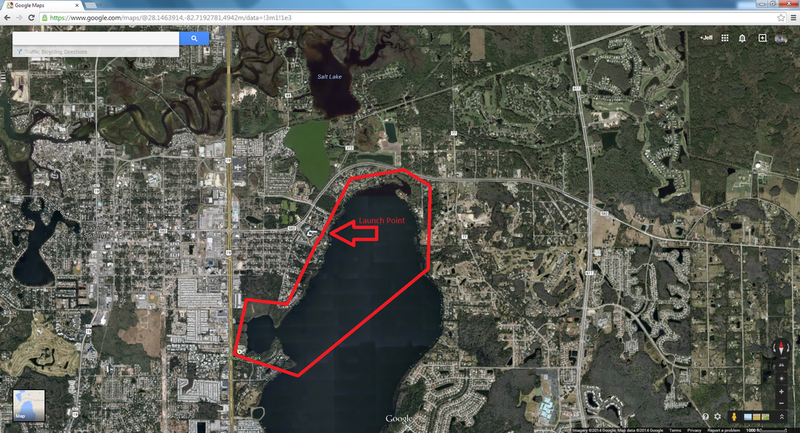 I also use wind direction and tidal flow to determine which spots within that zone will most likely be holding fish. Usually I plan a "route" from start to finish within my zone where I hit all the "hot Spots" with the eventual goal of ending up back at my launch point. I rely on fishing reports, solunar tables, wind speed/direction, tide stage and past experience to choose my zone each time I go out. Google earth always has a scale on the bottom right of the screen that lets you know how many feet one inch of map area represents, I like to zoom out to where it reads 1000 ft. for every inch and then take out a ruler and measure about 5.25" see what a mile is on my map. I then draw out my zone in paint or PowerPoint. 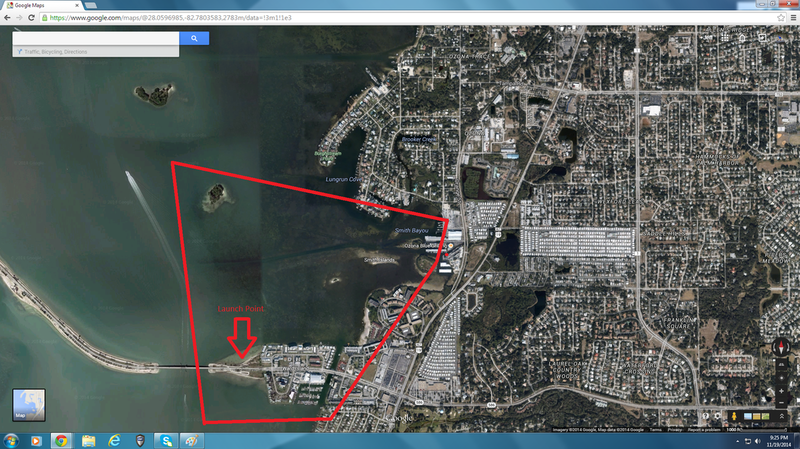 Here are some examples of zones in the area I live in that I frequent often. I marked each launch point with an arrow.